Eddie Kim was once an All-American first baseman at James Madison University, who helped guide the Dukes to a program-record 44 wins and an NCAA Tournament berth in 2002. The lefty slugger holds the school record for career batting average and putouts and is a member of the JMU Athletic Hall of Fame. Following a six-year professional career, including three years with the Oakland Athletics, Kim returned to northern Virginia to begin coaching and pass on his knowledge of the game. In 2015, he established the NOVA Premier program on a foundation of JMU alumni who share the same goal. “We are all done living in our glory days. It’s now about taking what we have learned and passing that on,” Kim said. Kim understands building a successful program starts with coaching, and has made a conscious effort to recruit recent JMU players to join his staff. Since founding the program, Kim has hired over a half dozen coaches who played at his alma mater and has seen his program grow from two 13u teams, to eight teams across five age divisions as a result. Mike Scorria was most recently hired after graduating this summer following a four-year career as a JMU outfielder. He joins his former teammate Brett Johnson, who graduated in 2017 following a five-year career as a first baseman. Former JMU pitchers Aaron Hoover and Mark Gunst have also been on-staff. Jason Troilo and Paul Koch, both catchers for JMU in the early 90s, bring a different element to the NOVA Premier staff. Troilo played professionally in the New York Yankees’ organization while Koch has over 20 years of coaching experience, including several years in Beijing, and is currently the head coach at Rock Ridge High School. Kim has also hired former professional players Brett Dalton and Brennan Middleton. Dalton played at the University of California, Irvine and was drafted by the Philadelphia Phillies while Middleton was drafted by the Washington Nationals following a career at Tulane. “We are bringing in guys with high baseball I.Q. that can work with kids on a specific skill set and can teach the little nuances of the game that most kids don’t know,” Kim said. By mixing a full schedule of practices, games, showcase events and tournaments, players are able to develop and get instruction while still getting a balance of high competition. Players also get unlimited access to the program’s indoor hitting facility in Sterling. Though the focus is on player development, NOVA Premier also offers a lot of value in terms of college exposure. Every year, the program will attend JMU’s team camp and have opportunities to visit and tour the campus and facilities. Along with the program’s connection with Marlin Ikenberry and his staff, Kim targets different camps with multiple college coaches and is able to bring local scouts to NVTBL games. “We are fortunate enough with our connections, especially with local schools, so players are getting a mixture of constant development with exposure to college coaches,” Kim said. For more information on the NOVA Premier program, visit their Facebook page at www.facebook.com/novasportsacademy. 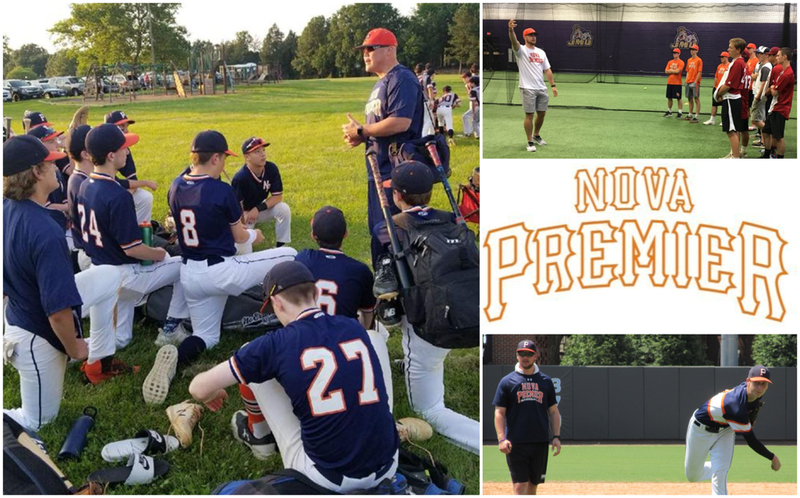 NOVA Premier is one of five program’s in NVTBL’s Premier Showcase League. Photos provided by Josh Belanger and NOVA Premier.